HAVOC a 36th Origin Award Nominee! 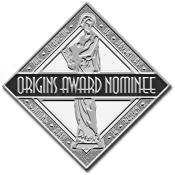 The Academy of Adventure Gaming Arts & Design, in conjunction with The Game Manufacturers Association (GAMA), have announced the nominations for the 2010 Origins Awards.I’m extremely excited (and proud) to report that HAVOC has been nominated for Best Miniature Rules. Congrats! Will the rules be sold at Origins? I’m attending and I’d like to buy a copy there to save on shipping and delivery hassles (I live in Italy). Any chance we can lure you down to Georgia to demo the game? You are in Kentucky correct? I’m in Florida, actually, but I travel to Georgia fairly often. So, yes, it wouldn’t be too hard to lure me there! What type of gaming does your group do? We are in and around Kennesaw (near the giant Hobby Town). I am sure we could meet you elsewhere if required. We game primarily in 28s and cover most genres expect Napoleonics. We were considering Havoc for fantasy gaming primarily. Sorry…grabbed Kentucky from the copy of the rules I recently purchased. I should be able to get at least 4 players if not more. I am enjoying reading through the rules but seeing it on a table suits my learning style. Kennesaw would work out really well. I’ll email you when I have some dates and details available. Fantastic! I will work around your schedule. We will probably need to reserve some table space at Hobby Town so let me know and I will take care of that.